African Golden Cats are medium sized cats and they have a body length between 61 and 100 cms (24 - 39 inches), a tail length between 16 and 46 cms (6.5 - 18 inches) and they weigh between 5.5 and 16 kgs (12 - 35 lbs). 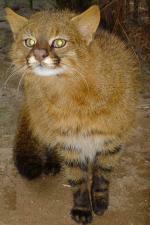 Andean Cats are small cats and they have a body length between 58 and 64 cms (23 - 25 inches), a tail length between 41 and 48 cms (16 - 19 inches) and they weigh approximately 4 kgs (8.75 lbs). Asian Golden Cats are a medium sized cat and they have a body length between 75 and 105 cms (29.5 - 41.3 inches), a tail length between 40 and 55 cms (15.7 - 21.7 inches) and they weigh between 6 and 15 kgs (13.2 - 33 lbs). The Canadian Lynx is a medium sized cat and they have a body length between 0.8 and 1 m (2.5 - 3.3 ft), a tail length between 5 and 14 cms (2 - 5.5 inches) and they weigh between 8 and 14 Kgs (18 - 31 lbs). They are silver grey/brown in colour. Caracals are labeled as small cats, but they are the heaviest and fastest of all the small cats. Their body length is between 60 and 91 cms (23.5 - 36 inches), their tail length is between 23 - 31 cms (9 - 12 inches) and they weigh between 6 and 19 Kgs (13 - 42 lbs). 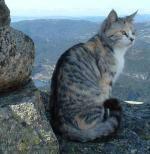 Chinese Mountain Cats have a body length between 70 and 85 cms (27.5 - 33.5 inches), a tail length between 30 and 35 cms (11.8 - 13.8 inches) and they weigh between 4.5 and 9 kgs (9.9 - 19.8 lbs). Colocolos are small cats and they have a body length between 51 and 76 cms (20 - 30 inches), a tail length of 30 cms (12 inches) and they weigh between 3 and 7 kgs (6.6 - 15.4 lbs). 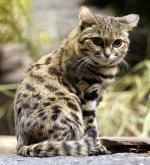 Flat-Headed Cats are small cats, typically around the size of a domestic cat. They have a body length between 41 and 50 cms (16 - 20 inches), a tail length between 13 and 15 cms (5 - 6 inches) and they weigh between 1.5 and 2 kgs (3.25 - 4.5 lbs). 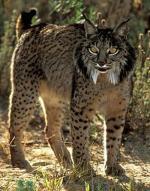 The Iberian Lynx and the Eurasian Lynx are very similar in appearance except the Iberian Lynx is about half the size. They have a body length of between 85 and 110 cms (34 - 43 inches), a tail length of approximately 13 cms (5 inches) and they weigh between 10 and 13 Kgs (22 - 29 lbs). Jaguarundis are small cats that that appear to be more like mustelids than felids in their overall proportions. They have a body length between 55 and 77 cms (22 - 30 inches), a tail length of between 33 and 60 cms (13 - 23.5 inches) and they weigh between 4.5 and 9 Kgs (10 - 20 lbs). http://onlinepollservice.com/ trick to get unlimited google plus votes.